Estimated reading time: 3 minutes, 55 seconds. It may be February, but did you know that the Spring Festival is taking place in just a few days? That Spring Festival is also known as Chinese New Year or Lunar New Year—the most important holiday in China. In fact, Spring Festival is what the holiday is called in China, and it is a time to celebrate the end of winter’s coldest days and welcomes the upcoming planting and harvest season. Spring Festival is celebrated by people of Chinese descent throughout the world, as well as by other countries including Indonesia, South Korea, Malaysia, Vietnam, Taiwan, Singapore and more. Happy Chinese New Year 2019. The Year of the Pig! The date for Chinese New Year is determined by the lunar calendar. The lunar calendar is based on the different phases of the moon, unlike the Gregorian or “western” calendar that is based on the sun’s movement. What that means is that the date for Chinese New Year is not the same every year, although it will fall somewhere between January 21 and February 20. This year Chinese New Year is on Tuesday, February 5. The official public holiday in China is seven days long, lasting from Lunar New Year’s Eve on February 4 to February 10, the sixth day of the first lunar month. Every Chinese New Year a new animal from the Chinese zodiac is chosen to represent the year. There are 12 Chinese zodiac animals: Rat, Ox, Tiger, Rabbit, Dragon, Snake, Horse, Goat, Monkey, Rooster, Dog and Pig. The zodiac animals play a significant role in Chinese culture. Each animal symbolizes certain personality traits and characteristics. Similar to how western astrology works, people are believed to possess the characteristics of the animal sign in which they are born under. The year 2019 is the Year of the Pig. The pig is a symbol of wealth and fortune. Visit ChineseNewYear.net to learn more about the personality and characteristics of the pig, according to the Chinese zodiac. Every Chinese New Year, billions of trips are made as people travel to celebrate the holiday with their families. This travel phenomenon is actually known as the world’s largest annual human migration! People will journey distances short and long to eat with loved ones on New Year’s Eve. This reunion dinner is one of the most important parts of the Chinese New Year holiday. Throw your own Chinese New Year feast and invite the special people in your life to participate. On your menu should be Chinese New Year staples such as dumplings, which symbolize harmony, wealth and reunion, and fish which represents prosperity. Visit China Highlights to read more about the 7 lucky foods to eat during Chinese New Year. If you are planning on hosting a Chinese New Year celebration, now is the time to clean, clean, clean! The tradition is to clean your home completely BEFORE the New Year, not during the holiday. You are symbolically cleansing away all the bad luck from the past year and giving your home a fresh start. Sweeping the house DURING Chinese New Year can be considered a taboo and is thought to be unlucky since you could be sweeping away newly arrived good luck. On Chinese New Year’s Eve, red envelopes – or hong bao in Chinese – filled with money are given to children, single adults and seniors. Red symbolizes good luck, happiness and energy. 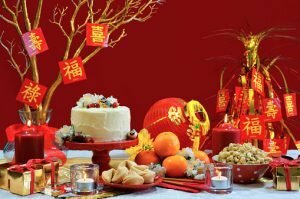 The money is known as “lucky money” or “New Year’s money” and is given in hope that the receivers will be blessed with good fortune in the new year. The Chalk Academy has some free Lucky Chinese Red Envelope printables on its website. Download and print the envelope templates and you and your children can cut out, fold, glue and decorate them together. Many places around the country hold public Chinese New Year events. San Francisco, New York, Boston, Honolulu, Chicago, Philadelphia, Washington D.C, and Los Angeles are just a few of the cities that host parades celebrating Chinese culture with food, lion dancing, floats, music, fireworks and more. Celebrate Chinese New Year at parades and special events happening around the country! However you choose to acknowledge this holiday, we hope you have a new year filled with happiness, good luck and prosperity!